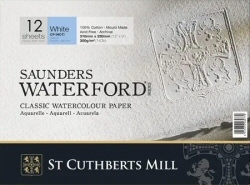 Saunders Waterford is a top quality professional watercolour paper. The paper is mold made, 100% cotton, gelatine sized and buffered with calcium carbonate. - Half Sheets and Full Sheets in natural white and high white. The pads and blocks contain 12 sheets. Half sheets are 56x38 whilst full sheets are 56x76cm. Measurements may vary slightly due to the deckled edges of the paper. Large sheets are denoted with an L. There is a five sheet minimum for Large Sheets. You can mix any brands and types of paper to reach the five sheet minimum. Full sheets are 56x76cm with four deckled edges. Half sheets are 53x38cm with three deckled edges and one straight cut edge. Measurements may vary slightly due to the deckled edges of the paper. Large sheets are denoted with an L. There is a 5 sheet minimum for the large sheets. You can mix any brands and types of paper to reach the five sheet minimum.